I wear my awesome engagement ring that was custom-designed to look vintage. It has lots of leaf/flowery detailing and a white sapphire flanked by two blue sapphires (my birth stone). Because my engagement ring was so special (like yours) and so impossible to match, I went with a plain white gold very thin band with a special engravement. I didn't want a big diamond when I got engaged, so my (now) husband got me three bands with itty bitty diamonds across the front. I had one when we got engaged, and got the other two when we got married. I LOVE the wall of sparkle when I wear all three, but I usually just wear one. I love it's simplicity. Beautiful ring! I usually wear both my engagement ring and wedding band...unless I'm doing something involving lots of dirt. Then I just wear my wedding band...I agree with you I like having a ring on that finger! I'm currently just sporting my engagement ring - it has diamonds all the way around and then a center stone on top. My fingers are so tiny that too much more would look gaudy. I may add a thin white gold band someday or possibly an eternity band to match the band on my engagement ring. I like the idea of 2 bands to signify the actual marriage. i'm still wearing the rings that my husband gave me 34 years ago- a diamond on one ring with the band together. We didn't have a bunch of money and because my engagement ring was special (his great grandmas from mid-1920's) I still only wear that. We've talked about getting me something simple like you're looking at for when we have kids to keep my special one pristine. My story is similar. My antique engagement ring is from the late 1800s. I had a wedding band made to match the fancy scrollwork on the side, but they still didn't look right together. Plus, I kind of wanted something on top of my engagement ring so that it could never slip off. I was at Target one day before my wedding, and I saw a set of two thin gold bands set with teeny tiny chips of diamonds running across the top of them for only $75 for BOTH! So now I wear all four rings every day. My wedding band first, then an el cheapo diamond band, then the engagement ring, then the second diamond band. All together they have the look of stackable jewelry, and I love it. My wedding band and engagement ring are also in a wave pattern! When hubby and I went to Europe last year, I bought a cheap silver band (at JC Penney, haha!) to wear instead of my wedding/engagement set. Now that simple silver band has become my go to ring for beach days, etc. I love it. 8 and up is $44 more, which is still a bit cheaper, but not by much. 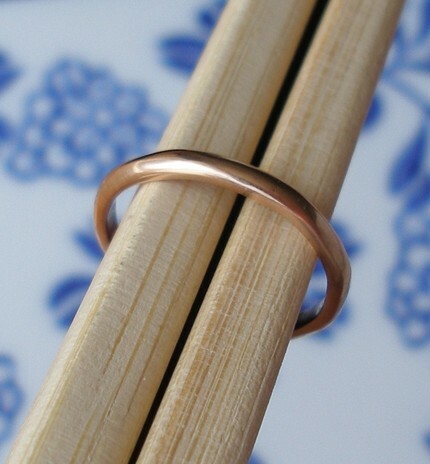 they have some really pretty rings though- just nice to browse. i don't know what i would want if i get married, but i love the rings they have. i like some of the stuff i've seen that looks simple and not too perfect. I have a vintage wedding ring that I wear alone... we decided against a band due to its unique (and large) shape. I said it was a good excuse for him to buy me an anniversary band at some point! ;) I love this idea too... I could wear said anniversary band as a temp ring when in the ghetto! i always figured i would wear a simple band alone, but i ended up getting a band made to match the engagement ring that has been passed down through my husband's family. our wedding rings were the last thing on our to-do list. they were shipped to the wedding site so i didn't even see them until the big day. eeps! I love how everyone's rings are so meaningful to them. I think because I don't have one I tend to think of them as just jewelry. BUT clearly they are much much more. I wear a brick colored tattoo on my hip in Mark's handwriting that reads "You're my Home." It was part of our vows to each other that where the other person was, we would pledge to be - and to be HOME in that place. i'm having a love affair w/ rose gold right now. mostly as home accents than jewelry. i wear a diamond solitaire engagement ring only. i personally think it's hard to get the look right of two rings stacked together. i find a lot of women's pairings to look clunky or to not work in harmony. and secondly, for me to get a second ring just felt unnecessary. why spend hundreds or thousands of dollars on anything in life, that you deem unnecessary or don't really want that bad, right? i told myself if i wanted one at a later time, we'd get it, but i never did! perfect decision for me + for us. if i were to do it all over again, i'd do the same, or go with a simple gold band instead of the diamond. i'm a hippie at heart i guess. I just wear my engagement ring, which is really supposed to be the accompanying band to an engagement ring. My husband and I are pretty poor right now but I'm happy with this. One day I'll get to pick out something fabulously vintage looking, for an anniversary or just because he loves me. But right now it's simple. And I like it that way. i have noooo gauge for what these things should cost, but i am SO glad you like rose gold too. it's so unique and lovely!!! my engagement ring was a simple round solitaire. then i got two side bands with tiny emeralds & diamonds on them (which we sautered all three together). unfortunately, 12 weeks into my first pregnancy my fingers swelled so much i could no longer wear my ring & my fingers are still too fat. a bad thing about emerald is it's a very soft stone, so everytime we get my ring sized one or two break & they have to be replaced. so we decided not to size it anymore & sadly, it sits in my jewelry box. for our second anniversary we stopped & i picked out a "right hand" ring to place on my wedding finger. it's more like what i would have picked had i been the one ring shopping for our engagement. it looks vintage, with details on the side & little white & yellow diamonds. i love it. oh hi, i think this is the first comment i've ever left & now it's a novel. I wear my engagement ring and wedding band every day regardless of where I'm going or what I might be doing (though I do take it off for cleaning and such). The boy did a wonderful job picking out the set (which had sadly been through a divorce previously, so now they get a chance at being a part of a happy marriage). I love how special your ring is, and I would probably consider doing the same - having another band to wear just to be sure it was never lost or stolen. im so excited !!! i thought i would never find ur blog again!!! I wear a Claddagh Ring and I know a lot of people that wear and use them for wedding rings or just to Symbolize that they are taken, they range in prices. I love what you that you and Levi are exploring the concept of being HOME to each other. For me it has felt like part of what makes us WORK and not break is that idea - that I am centered in Mark and that means I don't get to leave. Mark sys that he has been feeling this more and more since we moved - surprised to find that Seattle is home because I am here. For me, honestly (and painfully) I have most felt like he is my home when I am giving up something to be with him and finding that it's worth it. oh marriage - how beautiful and mysterious.